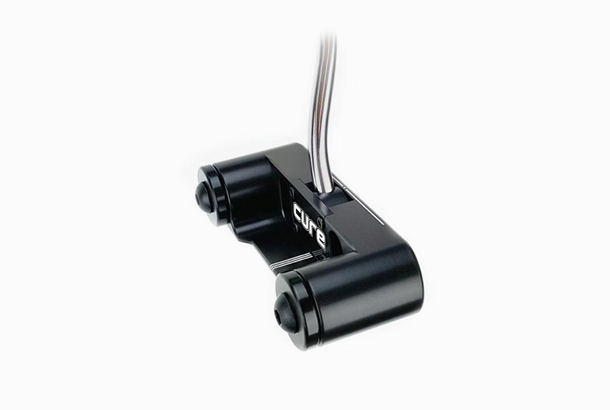 All Cure putters are CNC Milled in the USA. The RX4 has a 5.50” blade length which is well oversized (but not the largest in Cure’s range) and it helps raise MOI to levels that blow most others out of the water. Cure say the extra MOI improves stability, delivering unmatched forgiveness on mishits, which ultimately translates to better distance and directional consistency. Most of the high MOI putters you’ll see in the hands of tour pros can’t boast an MOI higher than 5000 g/cm2. The RX4 though when teamed up with its changeable weight kit and a couple of wrenches offers between 6900 – 14600 g/cm2, which trust us is absolutely huge. There’s clever lie angle adjustability built into the hosel, which offers great potential to set up the RX4 to suit your own putting stance and style. The only downside is the RX4s massive head that barely resembles a putter. The head dwarfs the ball at address, and the face is so long it’s 1.25” bigger than the size of a putting cup, which all three testers agreed gives the putter an unnatural look. You need to be a serious MOI junkie to give the RX4 a second look. If you can see past the appearance and convince yourself to let the massive MOI numbers and forgiveness do the talking, then it might be worth exploring further. For us we fell at the first hurdle, and struggled to see past the huge ungainly head.